My wine had low turbidity but still needed extensive filtering – why? We often hear our winemaker customers complain “the wine had a turbidity of less than one NTU but the bottling company charged us extra for filtration!”. This extra filtering needed at bottling is often unexpected, but there are two tests that can be done to check the condition of the wine prior to sending it for bottling, to help prevent these nasty surprises. These tests and how to best utilise them is detailed below. Prior to bottling most wines require some filtration, in many cases through membrane filters. As wine is a complex medium with a wide variety of constituents, it is not always easy to tell how well the filtration will proceed. Even wines that appear very clear can block filters and cause delay and extra expense if they need extensive filtering prior to bottling. There are two specific tests that can be used to determine how easy the wine will be to filter; this ease of filtering is commonly known as filterability. The clarity of wine is often measured by a benchtop turbidity (nephelometery) meter. This is a measure of the particulates in wine, the unit of measure being Nepholmetric Turbidity Units, usually abbreviated and referred to as NTUs (Nephelometer comes from the Greek for ‘cloud’)(1). The principle of measurement of a turbidity meter is that a light beam is shone into the wine sample and the light scattered by particles in the wine is measured. The scattered light is measured in NTUs, the higher the number the cloudier the wine. 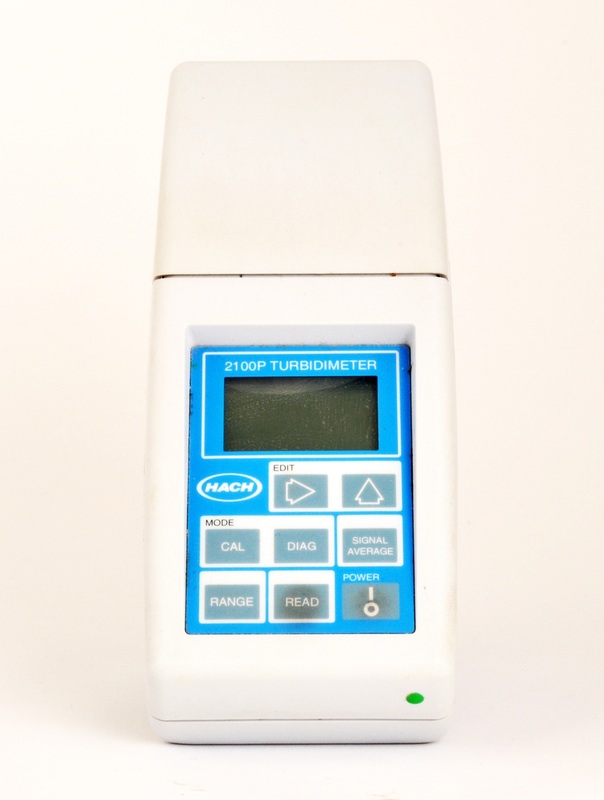 Turbidity meters are quite a simple instrument to use and are often found in small winery laboratories as they are often used during the fermentation process as well. A common and popular brand can be obtained for less than $2000, so they are relatively inexpensive if regular testing is required on site. This test is also usually offered by consulting laboratories as well, so if a winery doesn’t have a turbidity meter they can get a measurement done quite easily and cost effectively, for typically less than $20 per sample. It is of course important the wine is homogeneous prior to sampling. However particulates are not the only constituents of wine that can cause poor filterability. Large dissolved molecules and colloids are also present in wine and as they are not particulate, they are not measured in the turbidity tests. A less common but also important measurement is Filterability Index (FI). This is a measure of how easy the wine is to filter and can be very useful when the wine appears clear but has non-particulate materials that can cause filter clogging. Such materials include glucans, proteins and the now the more commonly used carboxymethylcellulose (CMC) (2). The Filterability Index test involves filtering a wine under certain conditions. In a popular wine analysis textbook (1), the conditions recommended are 2 bars of pressure and a 25mm diameter 0.45um membrane filter. A simple calculation gives an FI measurement; this can be compared to the FI limit that the bottler recommends. The higher the FI number, the lower the filterability. As well as using the same filter material that is used in the bottling line, it is also wise to do the filterability test at the same temperature as the filtration will be done in the bottling line to ensure the best correlation between the filterability test and the actual filtration is obtained. 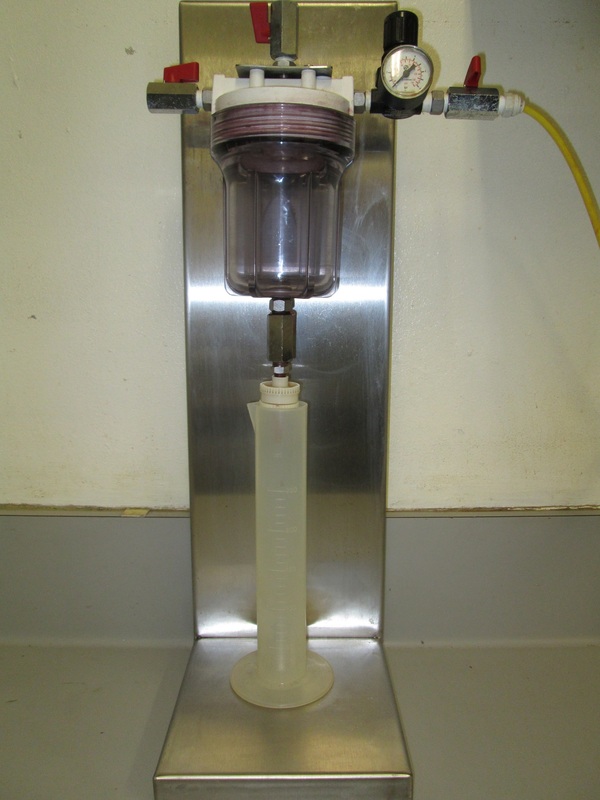 A basic and manually operated Filterability Index apparatus can be readily purchased and used in your own laboratory. A typical setup costs approximately $2000. They are quite simple to use but do require a gas bottle (typically nitrogen) for applying pressure to the wine being filtered. The only consumables used are the membrane filters and these are very inexpensive. Automatic instruments are also available but come with a price tag of around $12000. These could well be suitable for larger wineries with their own bottling lines and also for bottling companies. It is doubtful if this expense is warranted for smaller wineries. One key problem with doing this test yourself is that it is important to use the same filter material that is used in the filters in the bottling hall. As there is no one standard filter material that is used in bottling halls, it is important to find out what membrane material they use in their filtration and match the same matrix in the Filterability apparatus in your laboratory. This means that each winemaker or laboratory manager needs to check with their bottling hall and be sure they can match the filter material. If the FI apparatus is out of your price range then another way to get a Filterability Index measurement done is to send a sample of your wine to the bottling company prior to shipping the wine for bottling and ask them to do an FI for you. The bottling company should have a FI criteria that they stipulate and by getting them to do the FI test, you should be sure they use the same filter media in the test as well as in the bottling hall. One other problem with the FI test is that there is not one standard version of the test that is used across the industry. In a recent article (2) some changes were recommended to the test that are purported to improve the reliability of the results. Commendable as this is, it does show that a standard test procedure has not yet been agreed by all, which is why comparisons between different laboratories is difficult. It is recommended that all wines are tested for both Turbidity and Filterability Index prior to being sent for bottling. These tests can be done in the winery laboratory, the consulting laboratory or at the bottling hall. By performing both these tests a better idea can be obtained as to how well the wine will pass through membrane filters, thus potentially saving time and money for the winemaker. Unfortunately there is no one standard Filterability Index test, so it is best to work in with the individual bottling line and adopt the same procedure used there to avoid any discrepancies and confusion. https://www.vintessential.com.au/wp-content/uploads/2018/12/filtration-apparatus3.jpg 2581 1936 VintessentialAdmin https://www.vintessential.com.au/wp-content/uploads/2018/11/vintessential-logo-2.svg VintessentialAdmin2015-04-15 09:04:002019-04-12 04:42:15My wine had low turbidity but still needed extensive filtering – why?